This 28 cu. ft. 3-Door French Door Refrigerator features an attractive design with a large capacity, high-efficiency LED lighting, and an ENERGY STAR rating. It also features a Twin Cooling Plus<sup></sup> system that helps to keep food fresher, longer. Provide sufficient storage for a variety of food items with this 16.4 cu. ft. Haier quad-door refrigerator. It has dedicated high-humidity controlled crisper bins with HCS filters to help maintain the freshness of leafy greens longer, and it operates efficiently with its auto-defrost function. This 32.8-inch Haier quad-door refrigerator ensures simple operation with its electronic touch controls. 36-inch 28 cu. 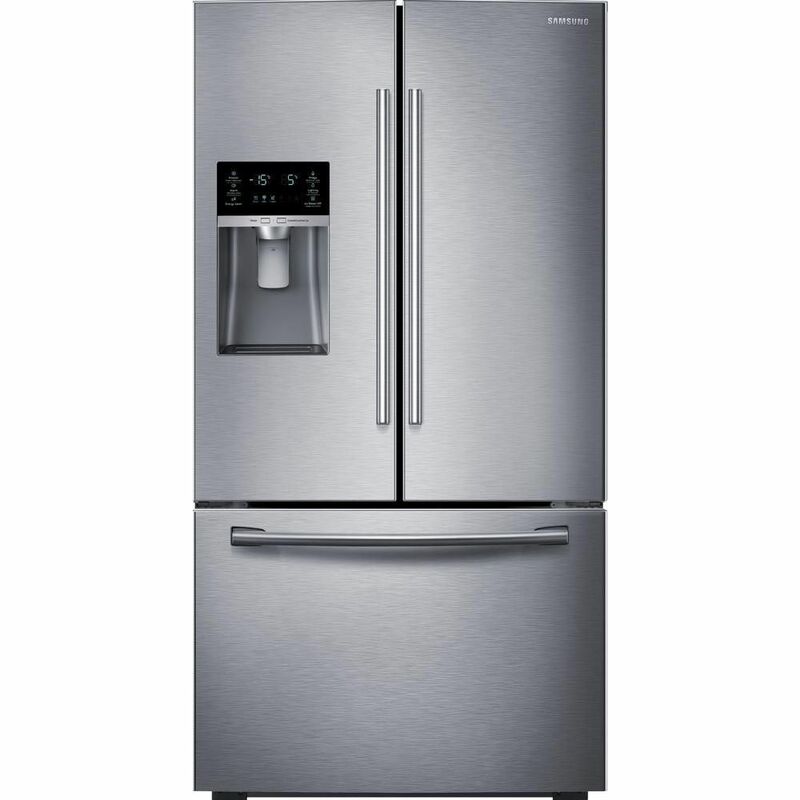 ft. French Door Bottom Freezer Refrigerator in Stainless Steel with CoolSelect Pantry - ENERGY STAR® This 28 cu. ft. 3-Door French Door Refrigerator features an attractive design with a large capacity, high-efficiency LED lighting, and an ENERGY STAR rating. It also features a Twin Cooling Plus<sup></sup> system that helps to keep food fresher, longer. 36-inch 28 cu. ft. French Door Bottom Freezer Refrigerator in Stainless Steel with CoolSelect Pantry - ENERGY STAR® is rated 3.6 out of 5 by 535. Rated 1 out of 5 by WILL from THE ICE MAKER AND WATER DO NOT WORK WELL. ... THE ICE MAKER AND WATER DO NOT WORK WELL. THE ICE CUBES ARE WHITE AND MAKES THE DRINK TASTE BAD. THIS IS AFTER THROWING 5 GALLONS OF EACH OUT. THE WATER THE DOOR DOES NOT SUPPORT THE WEIGHT NEEDED FOR BIG DRINKS. THE DOOR IS SHIFTING DOWN. THE INSIDE OF COURSE DOES NOT HOLD TALL DRINKS IN THE STANDING POSITION. THE WARRANTY SAMSUNG OFFERS IS WORTHLESS. THEY MAKE APPOINTMENTS AND NEVER COME OUT. I AM TRYING STILL TO GET SOMETHING BACK FOR THIS DISASTER. NO ANSWERS. JUST APPOINTMENTS AND RUN AROUNDS. Rated 3 out of 5 by Becky from The refrigerator is nice looking on the outside.... The refrigerator is nice looking on the outside. Rated 1 out of 5 by TexasFrank from Model # RF28HFEDBWW, essentially the same unit as this one featured. Purchased May 2014 with 5 ye... Model # RF28HFEDBWW, essentially the same unit as this one featured. Purchased May 2014 with 5 year extended warranty. First three years without issue. After that everything that could go wrong did. Technicians have been out to work on it more than a dozen times. The icemaker is a nightmare. It began to freeze over and multiple attempts to repair it have been useless. Techs initially thought that improper sealing of the icemaker cabinet was the problem. Several attempts to caulk it did not fix the issue. The icemaker and the auger have been replaced twice. When the icemaker compartment froze it cracked the back panel of the refrigerator and it had to be replaced. The evaporator and temp sensor have been replaced, the temp sensor twice. The main computer board has been replaced and the unit still "geeks" out (the door display quits). Occasionally the refrigerator temperature rises into the 50s F before the compressor comes on. The unit makes odd noises and none of the techs can determine what it might be. Today (3/31/19) it quit. We put the essential items in our spare GE refrigerator (14 years old and going strong), ate some of the other stuff and resigned ourselves to having to throw quite a bit of it in the trash. Less than 5 years for a $2,000 refrigerator is outrageously unacceptable. Samsung's revolving door they call service would be laughable if it hadn't already cost us many hours of telephone time and now ruined food. We are now about to initiate litigation under federal lemon laws due to Samsung's (and their extended warranty partners) reticence in resolving this problem product. We will never again purchase a Samsung product. Rated 4 out of 5 by Vincent from Good fridge, huge inside, lots of room, good features. Only... Good fridge, huge inside, lots of room, good features. Only complaint is the protection film that Samsung puts on the fridge at the factory. it's like, they literally put the fridge together with the plastic already on the pieces and the plastic gets wedged in. It's hard to explain what I mean. Rated 1 out of 5 by LaurenMinj from If I could give less than a 1 star.. Ice maker!! The ice maker has been nothing but problems. It freezes up daily. Dethaw it to get the ice to work each day but now even that doesn't work.. I am beyond frustrated and all of the issues happened a day after our 3 year warranty expired. It is not a cheap fridge, so you'd expect the darn thing to work! Rated 1 out of 5 by Aleksei from Be careful when you are buying Samsung Fridge. Out unit did work for 3 years and then ice unit we... Be careful when you are buying Samsung Fridge. Out unit did work for 3 years and then ice unit went out. Few month later one of the temp sensor died and we had to replace it. Today freezer stopped freezing. All of this in 4 years... Fridge that you cannot trust. To see how often it's happening, google: "samsung ice unit repair" "samsung not cooling"